This 1977 vintage ROLEX OYSTER PERPETUAL DATE was just cleaned by our ROLEX trained watchmaker and is accurate and extremely clean overall. The solid 14k. gold and steel Jubilee style original bracelet has the usual stretch for its age and looks fabulous on the wrist. The steel Rolex Oyster case with solid 14k. gold bezel and ROLEX OYSTER winding crown gleams-without dings or scratches. The original Roman numeral white dial having gold toned markers and hands is pristine. The case measures 25.5mm.-easy-to-read and a subtle size compared to the larger new ROLEX. 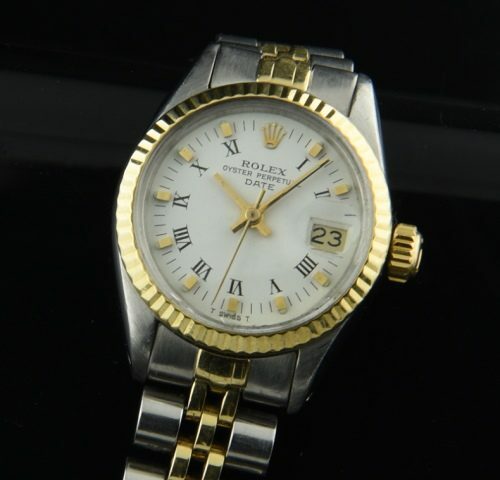 Save thousands and own this highly reliable lifetime ROLEX!